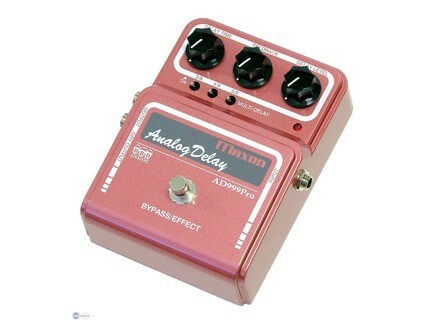 AD-999Pro Analog Delay, Delay/Echo/Phrase Sampler for Guitar from Maxon in the Vintage series. Godlyke Distributing has announced the availability of the Maxon AD999 Pro Analog Delay. The newest member of Maxon’s Vintage Series, the AD999 Pro is said to combine the best features of Maxon’s popular AD999 and AD-9 Pro delay units into a single, powerful package. It uses four custom-made Maxon MC4107D bucket brigade IC’s with 900 milliseconds of available delay time. 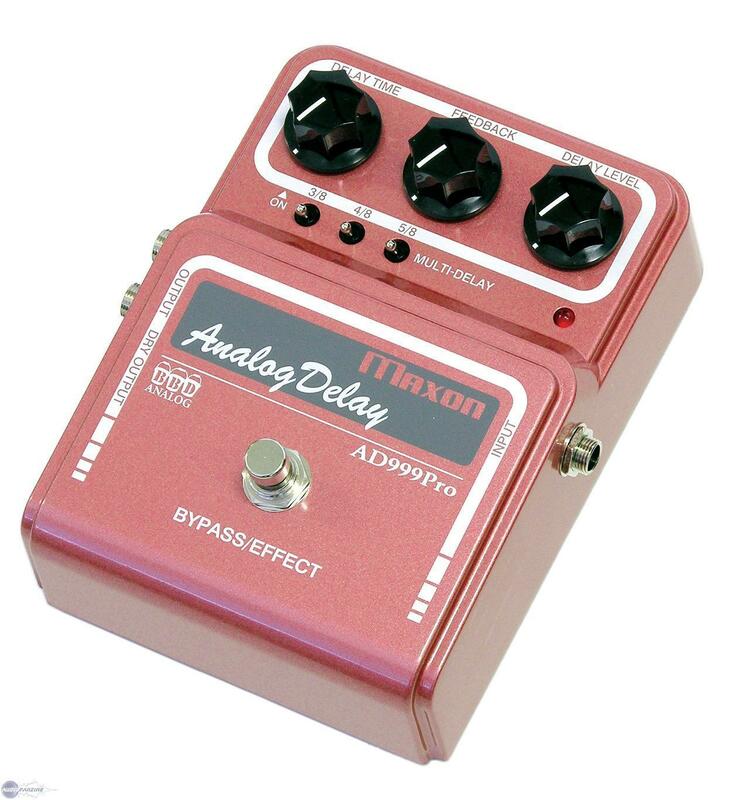 Delay repeats are then filtered using Maxon's proprietary RMS level sensor and companding noise reduction circuitry to provide the most pristine, low-noise analog delay tone available. With a wider dynamic range than most other delays and a max input level of +12 dB, the AD999 Pro can be used with any input signal and also in amplifier effects loops. The AD999 Pro’s improved low range response is described as yielding a bold sound not normally associated with analog delay, creating a delay tone that is simultaneously clear and firm yet retains the characteristic warmth of analog. The AD999 Pro features a new “Multi-Head” mode that feeds midstream delay signals back into the delay circuit to emulate the sound of multi-head tape delay operation. These feedback loops can be selected in a variety of combinations to create complex multi-tap delay repeats and rhythmic delay effects such as triplet- and sixteenth-note rhythms. The Multi-Head mode creates a tape echo simulation, or can be used to create ambient effects such as large room and concert hall reverberation. The AD999 Pro features Maxon’s standard DC-to-DC voltage converter/regulator circuitry that assures consistent performance regardless of AC power fluctuation. The AD999 Pro also ships with the new Maxon AC2009 power supply, which is said to provide very consistent high current that is regulated and filtered to provide stable, noise-free power. The AC2009 is auto-sensing, so it can be used anywhere in the world by simply changing out the detachable plug cord on the output side of the PSU. Topping off the AD999 Pro are Stereo outputs that allow panning of the delay signal to two amps or mixer channels and mechanical true bypass switching on both outputs via a custom 4PDT low-noise switch. The AD999 Pro has a list price of $533.32 for a street price of $399.99. More information available at www.maxonfx.com. Diamond Pedals Vibrato Diamond Pedals has announces the worldwide release of the Diamond Vibrato pedal. T-Rex Announces Tremonti-Endorsed Phaser T-Rex Engineering has announced the Tremonti Phaser, which is described by the brand as "a classic phase shifter for our time". Empress Effects ParaEq With Boost Empress Effects has announced that their Empress ParaEq w/Boost will be available December 3, 2008.